Our Architect Design Firm aims at producing more of futuristic designs, since such projects give the notion of progress to a city. 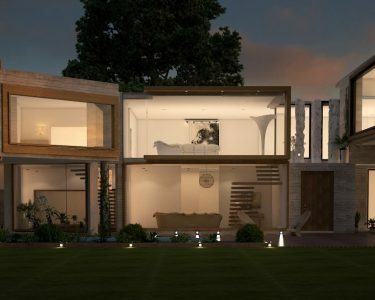 This is another one of our post-modern architecture projects, located on the famous Bedian Road of Lahore. This farmhouse is designed on post-modern lines and incorporates the contemporary design elements which are a need of time today. The ground floor of this farmhouse was already built when the project came to us, our Architecture Firm designed the upper floor extension to this building. Since the ground floor had a very well diciplined spatial arrangement, we decided to break the monotony and design the upper portion in a more fragmented manner. Various functions of the house on this portion are split into individual cubical chunks which are cantilevered over the lower built area. A certain part hangs over the swimming pool that is situated on the ground floor, while another part of the building sits over two slanted columns. These columns begin side by side from the ground and rise up to spread wider with the ceiling. 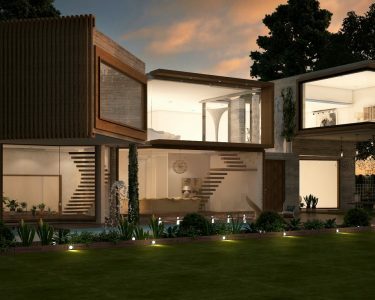 Such structural technique, along with breaking the monotony of straight lines, gives an opportunity to the building to provide extra amount of space which could be made use of. The use of materials in the exterior of this building is very basic, since we did not want to make a clutter of various different textures and colours. The brutal rawness of concrete and understated warm tones of wood allow the structural layout of the building to do the talking alone. While the interior of this farmhouse follows much lighter colour tones which creates an interesting dialogue with the exterior. 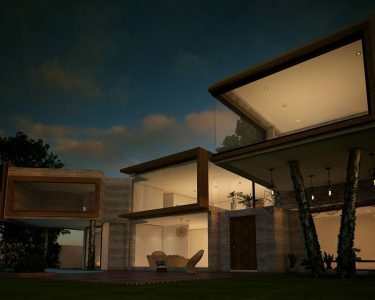 We at Archicubes aim to become one of the Best Interior Designer in Lahore and hence, do not believe in treating every building with a similar approach. Sometimes a certain elements of the design have to be mellowed down in order to allow the other major elements do the talking. This contast of balanced colours and textures plays a major role in presenting the building as a holistic design project.